Nepal for the first time is hosting the summit of Bay of Bengal Initiative for Multi-Sectoral Technical and Economic Cooperation (BIMSTEC) on August 30-31 in Kathmandu. This will be an important event for Nepal as the current chair and latecomer to join the regional body in 2004 along with Bhutan. This regional organization created in 1997 was natural fallout of the ‘look east’ policy of India and the ‘look west’ policy of Thailand and transcends to multiple areas of cooperation from trade, investment, and transport to tourism, agriculture, fisheries and trans-border terrorism. Altogether 14 areas of cooperation have been identified and each member country has been given the role and responsibilities of taking lead on at least one area of cooperation. The member countries were elated with the initiatives of linking two sub-region of Asia as a framework agreement of free trade area covering trade in goods, services and investment were signed in Phuket, Thailand in 2004. 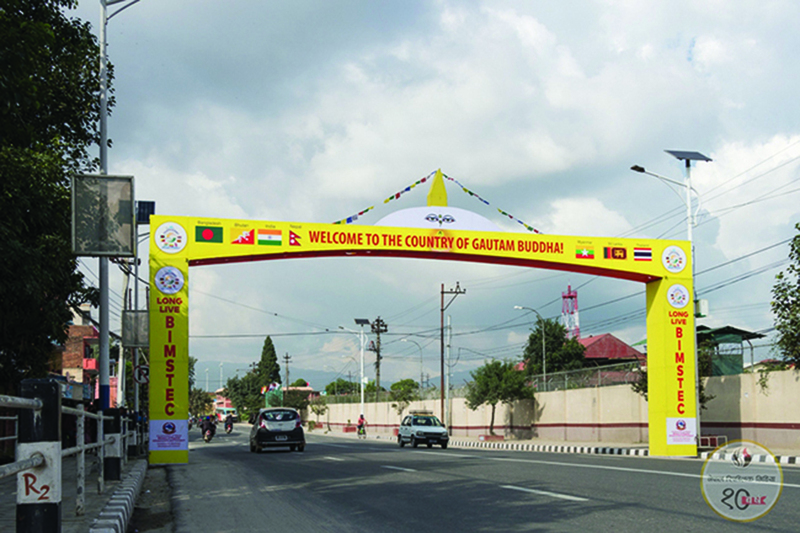 This was an occasion for the organization to welcome two new members—Nepal and Bhutan—which also raised a debate over the name of the regional organization that was derived from the initial letter of the five old members. 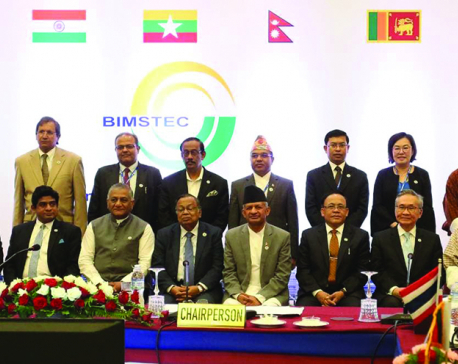 After some deliberations a new generic name for BIMSTEC was coined only with a slight changes; deleting the hyphen between the letter T and E.
One of the important achievements of the framework agreement was the formation of Trade Negotiation Committee (TNC) which was mandated with the responsibilities to carry forward the negotiation process and finalize the text of agreements within one and a half years for trade in goods and two and a half years for trade in services and investment. Among these, the agreement on trade in goods has made some progress, but is yet to be finalized and the remaining two are still to make a progress even after a period of 14 years. The other areas of cooperation didn’t get much attention as the member countries either lost their interest or were not adequately equipped to move forward. 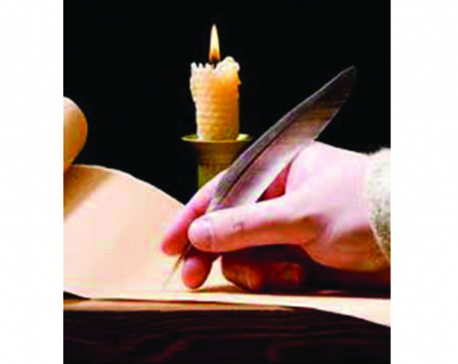 According to the declaration, the main objectives of this organization is to enhance cooperation on economic matters that include trade, investment, industry, tourism and agriculture, among others, accelerate economic growth and social progress and make best use of available synergy within the region. However, over the period the scope of dialogue and cooperation proliferated covering many areas but there was little focus on implementation. Meanwhile, the impact of political economy and the shifting strategic interests of the two big economies made a swerving movement. The bilateral engagement between India and Thailand through early harvest program in 2004 and several engagement on account of India plus ASEAN resulted in the loss of interest of these two economies in BIMSTEC process. Amidst the waning interest of the big economies, lights at the end of tunnel can be seen over the last few years. The renewed interest of India expressly augured well in hosting of outreach summit in Goa in October 2016. Government of India propounded the Act East policy as the replacement of old Look East Policy. It can be assumed that this policy is based on three imperatives. First, South Asian Association of Regional Cooperation (SAARC) has been languishing due to troubled relations between India and Pakistan and the appropriate platform to engage with the neighbors was needed for India. Second, the need of bringing economic and social transformation to North-Eastern States could be made possible by opening these territories to the east and third, containing the rising influence of China in South and South-east Asia under the rubric of Belt and Road Initiative (BRI). However, the road is not smooth as there are border disputes between Myanmar and Thailand. And the Rohingya crisis has been a bone of contentions between Bangladesh and Myanmar. Despite this, there are no serious problems in bilateral relations between the seven member countries. Thus the commitment of the BIMSTEC leaders in Kathmandu summit will certainly decide the future course of this regional process. One of the critical aspects that need attention of the leaders is the consolidation of the areas of cooperation which was largely expanded in 2008 without any concrete plan and concurrent implementation. Four areas may be considered as piloting and consolidating the cooperation which includes trade and economic integration, connectivity through multi-modal transport system, energy and people-to-people connectivity. The volume of intra-regional trade is abysmally low between the BIMSTEC countries. In 2014, the overall external trade of the seven member countries was around USD 1.19 trillion and the trade among these countries was merely USD 37 billion or around three percent of their total trade. Normally there are four factors that contribute to such low performances of trade: Persistent presence of tariff and non-tariff barriers, low level of transport connectivity, poor linkages of value chain in production process and poor linkages of services to boost up trade in goods. Debut on the promotion of trade hinges on early implementation of the agreement signed in Phuket in 2004 with the concurrent finalization of the protocols. The trade negotiating committee should be directed to finalize the text of agreement as early as possible. The ongoing development works for trilateral highway linking India with Thailand through Myanmar need to be expedited and necessary legal instruments should be put into action to drive a car all the way from Kathmandu or Delhi to Bangkok. The proposed coastal shipping agreement should be designed in a way that connects the land-locked countries with Bay of Bengal through their river system which helps to reduce their cost of transportation. The proposed agreement on power grid may be helpful in trading of electricity within the region. People-to-people connectivity within the region could be achieved through the cooperation among member countries in the areas of services like, tourism, health and education. Buddhist Circuit in tourism and introduction of BIMSTEC Business Travel Card (BBTC) for visa facilitation were discussed at length in the trade negotiation committee meeting in the past but it still remains an unfinished agenda. They are considered as low hanging fruits for enhancing people-to-people connectivity and building trust and confidence. Member countries should not miss these opportunities.